After racking for up to 26.219 miles during its 3,968th Martian day, NASA’s Mars rover Opportunity is said to have completed its first Red Planet”marathon” with an estimated finish time of 11 years and 2 months. “This is such a big win for NASA being the first time a human enterprise is exceeding the distance of a marathon of the surface of another world”. John Calls, the Opportunity project manager at NASA’s Jet Propulsion Laboratory stated. 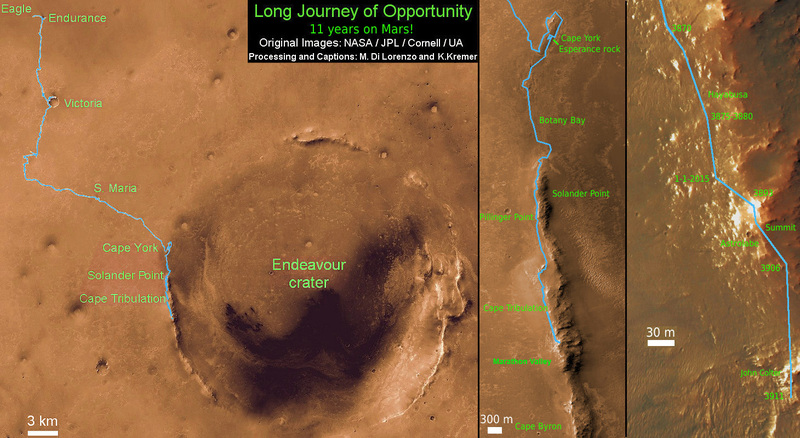 Opportunity’s achievement is not being taken lightly with a reference of being the newest kid on the block having travelled on an epic journey of 42 Km to explore Endeavour Crater on the surface of Mars. Its only last year that Opportunity was named the long-distance champion of all off-Earth vehicles after topping its previous record that had been set by the former Soviet Union’s Lunokhod 2 moon rover. However, Opportunity principal investigator at Cornell University, Steve Squyres has clearly said that the mission was not aimed at setting any distance records but the main aim was to make scientific discoveries on Mars and inspire future explorers to achieve even more. Originally Opportunity’s mission was expected to last for 92.5 earth days. However, 11years down the line, it is still on point even though with signs of age. Apparently, Opportunity established some proof that running water and groundwater once existed on Mars just six months into its search. Rocks that contained sulfate were also discovered After carrying out its operations beyond expectations because of its lifespan, the scientists chose to give it a long term destination of Endeavour Crater. While NASA’s Jet Propulsion Laboratory (JPL) team is responsible for planning a marathon-length relay next week at the Laboratory for celebration purposes, the marathon undertaken by Opportunity is named for a battle that occurred on Marathon plain. It is meant to imitate the legend of a Greek Messenger who run for 25 miles to Athens to tell of a military victory.